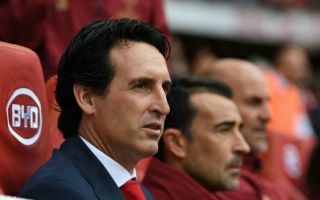 It’s been a difficult start to life in the Premier League for Arsenal boss Unai Emery, and there is reportedly an additional headache for the Spaniard that is ongoing. The Gunners have suffered back-to-back defeats to start the new campaign, albeit the games came against Man City and Chelsea with the fixture list not being particularly kind on Emery as he looks to get his team to settle under his stewardship. He’ll be desperate to see them register their first win when they face West Ham United at the Emirates on Saturday, but question marks have seemingly been raised over Aaron Ramsey’s situation on and off the pitch. As per The Mirror, the 27-year-old has yet to ink new terms with the club with his current deal set to expire next summer, and the decision to drop him against Chelsea last weekend could now have a negative impact on progress being made. It’s suggested that the Welshman was left ‘stunned’ to be left out at Stamford Bridge, and so that will surely now raise concern for supporters as to whether or not their midfield ace will put pen to paper on a new contract if he has issues staying in Emery’s starting line-up. Arsenal will not want to see him leave on a free transfer next summer given his importance to the team, thus opening up the possibility of cashing in during the January transfer window. Nevertheless, with plenty of time to go before that stage arrives, the ideal scenario will undoubtedly be to see Ramsey flourish in Emery’s system and prove himself to be a crucial cog moving forward. Whether that’s enough to convince him to commit his long-term future though remains to be seen, but perhaps for now the more immediate concern will be whether or not he returns to the starting XI this weekend which would suggest the change against Chelsea was perhaps merely tactical.